Santiago, a shepherd from Andalusia, has had the same dream twice, in which an angel brings him to the pyramids of Egypt and tells him that this is where he will find his treasure. Just as Santiago is about to pass on the suggestion he encounters a king, who tells the boy he should listen to the omens and follow his dream, for that is his Personal Legend—the one thing he is meant to do in this world. Thus begins the shepherd’s journey into Africa, where he meets a thief, a merchant, an Englishman, a woman, and an alchemist, and learns how difficult and how rewarding it can be to follow your dreams through to the end. Originally published in Portuguese in 1988, Paulo Coelho’s novel The Alchemist has sold millions of copies and inspired quite a following. Really, it’s unsurprising that someone would try to make a graphic novel out of it. In his introduction, Paulo Coelho goes on about how the Sea Lion Books adaptation is exactly what he dreamed of, so I went into the graphic novel (adapted by Derek Ruiz with art by Daniel Sampere) with relatively high hopes, but I soon found those hopes petering out. 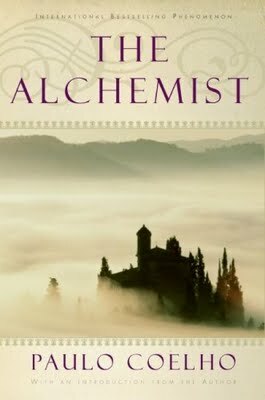 The Alchemist is a parable for following your dreams, and much of the prose reads like a fable. The narrative voice is one of the star aspects of the novel, moving the story at a steady pace from one thing to the next. It creates an easy flow that carries the reader through the book even where there is minimal action. The graphic novel takes much of that narration out, and that’s probably for the best. Most of the original narration is replaced with first-person introspection from Santiago, keeping the reader in Santiago’s mind and also preventing the art from being covered with blocks of text. The pacing of the graphic novel still gets clunky. There isn’t always a clear transition between scenes, with some pages literally jumping from day to night without warning. Sampere and Ruiz also don’t always give the proper amount of panel space to things. The image of Santiago becoming a monster and killing his sheep—a passing thought in the novel—is given 3/4 of a page, while his vision of the oasis being attacked isn’t granted a single image. The art does do an able job of showing other things, filling in settings described in the novel with stalls, buildings and palm trees. There are times, however, when the art is less vivid even than Coelho’s sparse descriptions. When Santiago enters the chieftains’ tent we’re given this description: “The ground was covered with the most beautiful carpets he had ever walked upon, and from the top of the structure hung lamps of handwrought gold.” This doesn’t seem too difficult to recreate, but the graphic novel shows us only an empty, blank room. Even while it merely matches or falls behind the descriptions in the original book, the graphic novel does take the opportunity to allow for a different view of a situation. When Santiago first shows up in Africa, a tavern owner tries to warn him about a thief, but because they don’t speak the same language Santiago thinks he’s assaulting him. In the graphic novel the tavern owner is given dialogue, so we see before Santiago does that the man is trying to help him, and we understand the trap he’s walking into. The graphic novel also offers its own interpretation of some of the more abstract parts of Coelho’s story, such as when Santiago is talking to the wind. Coelho describes it like any windstorm, but Sampere and Ruiz decide to portray the wind with the form of a woman. It’s a pretty straightforward, unadventurous interpretation of the scene, but it’s also one of the few times that the artist and script writer seem to put their own vision into the comic. One big issue I had with the graphic novel was its persistent grammar problems. While some were minor and might not be noticed by someone breezing through the story, this isn’t just my inner English major getting riled up. While the grammar mistakes are prevalent throughout (the artist’s introduction in particular is a horror to read) the real problem is that the mistakes are in lines that were copied verbatim from the novel. So, someone got it right once, and still the graphic novel managed to mess it up. That might not be the biggest deal, but it reeks of laziness that exists in other parts of the graphic novel as well, such as inconsistent character art and insufficient time spent on important characters like Fatima, the woman Santiago falls in love with. 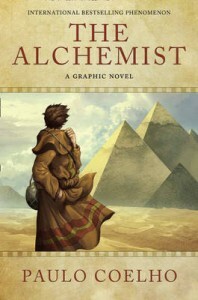 There are a number of things The Alchemist: A Graphic Novel does right, at least compared to other comic adaptations. Narration is minimized in favor of character dialogue, and Coelho is more or less correct in saying that “the graphic novel does not lose the essence of the story,” as the original points he tried to make in his novel are still relatively clear. But there are also a number of little things that stack up against the adaptation. The clunkiness and occasional laziness detract from the magical feeling of the story, leaving the adaptation OK at best. The graphic novel won’t win any more readers for Coelho, so if you want to read The Alchemist, or convince a friend to give it a try, I’d suggest sticking with the original novel. Angela started reading manga in high school when she found Cardcaptor Sakura, and it's all gone downhill from there. Angela is an unrepentant bookworm, and aside from graphic novels loves children's stories, thick fantasy novels, classic literature and anything by Paulo Coelho. She also holds an MFA in writing for children. You can find more of Angela's writing at The Fandom Post, and on her blog. You can also find her on Twitter.